Michael Pollan wrote that you should be able to defend the way you live or change it. I try to live according to that principle. At first glance, the moral case for eating meat seems to be lacking, which is why I once became vegetarian. But now, living and working on a farm, I have no moral qualms about eating the beef from our cows. Quite the contrary, I strongly believe that eating the meat from these happy and healthy animals is not just morally justifiable, but actively contributing to a better world. In this post I attempt to lay out my logic for this belief. Many people today argue that raising animals for consumption causes suffering and displaces wild populations of animals, so it is better to not raise animals at all. When I see some forms of industrialised agriculture, for example a stable with one million chickens, who I believe to be suffering their entire lives, I agree with them. But what if a farm animal’s life was good - truly good with a peaceful death? Vegans maintain that it is still not justifiable to raise these animals and prematurely end their lives - a cow could live a good 15-20 years! ... except that in the wild that would never happen. Lets look at a simplified example to illustrate the point. Before Europeans went to North America there was an estimated 60 million wild buffalo roaming the Great Plains. Today North America is home to about 100 million cattle. For simplicity’s sake, say one cow takes the living space of one wild Buffalo. It is in the nature of the bovine (buffalo or cow) to have one calf annually starting from the age of 1.5 years old - potentially 10 or more in a lifetime. With this kind of reproduction, the population should increase exponentially. So how come the number of buffalo was 60 million when European settlers arrived in North America and was more or less the same 5000 years before that. The reason of course is that the average life span of a buffalo was merely 3.5 years, not 15-20. Most Buffalo would die a premature death. In most cases probably not a pretty one. They competed for food. Many starved, others died in labor, others from infection or thirst, and many were eaten by wolves. Few lived a full 20 years. Now assume we have an idyllic farm, the way we wish they all were. 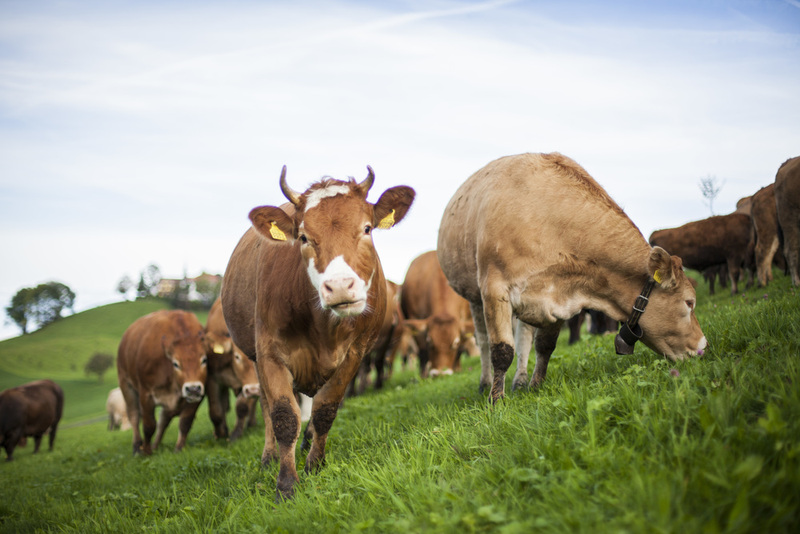 A 60 acre farm in the pastured mountains of Switzerland with a herd of 20 cows. Mothers have a calf each year. The bull runs in the herd. Calves drink from the mother as long as they want. After one year, the calf is large and no longer attached to the mother. He eats grass, and has found his position in the herd. The mother has a new calf to feed and is no longer attached to the older calf. After about 18 months, the calf has grown into a 1300-pound oxen. Room is limited in the herd as the 60 acres of pasture can only support 20 head of cattle not 21. So the oxen who has lived a very happy life, will now be killed. In a dignified and respectful way. His was a good life - a life worth living, possibly even better than his Buffalo cousins had in the wild. Death is part of life. All organisms that die are eventually consumed, if not by humans, then by microorganisms, insects, worms, rodents, wolves, fish etc... Instead of having a buffalo getting eaten by a wolf, we humans eat the oxen - with gratitude and respect for the dignity of the animal before us. Our challenge is this: if we can offer the cow a better life than nature could have offered the buffalo, it is morally acceptable to consume the meat of that cow. If instead, we fail to raise the cow better than the life of buffalo in the wild, then we should abstain from raising animals and eating meat. We have a moral obligation to do so. If we follow this logic, we would abstain from eating most meat and would instead have many more much happier cows, chickens and pigs on this planet.